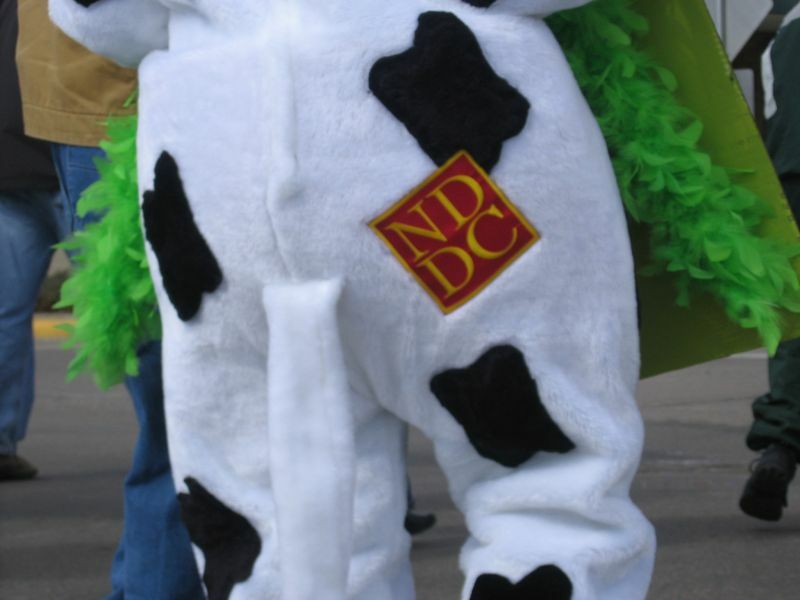 After a hundred and fifty years, Northfield’s downtown finally has a mascot! She’s black and white and furry all over with a red and gold NDDC brand on her backside. 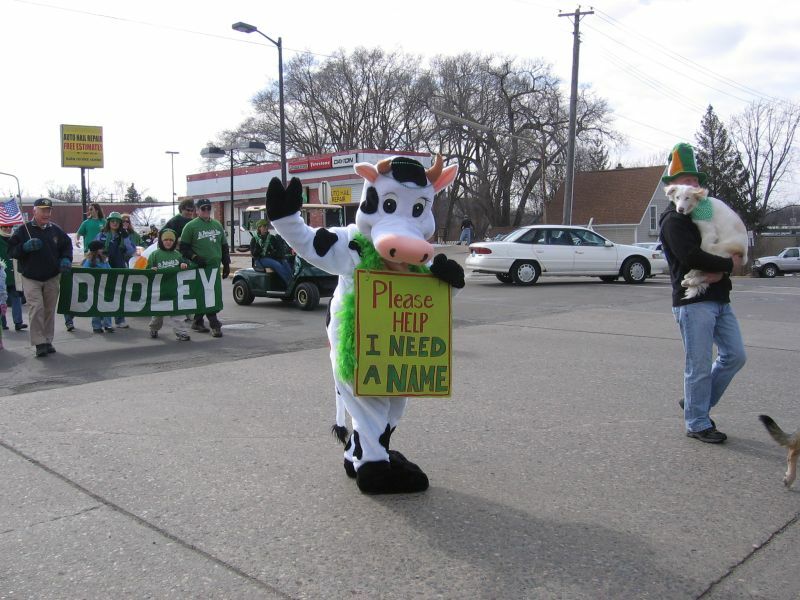 This cute and lovable cow will make guest appearances in the Northfield area over the next months to promote downtown businesses and encourage visitors to check out the great restaurants and shops that Northfield has to offer. She will represent the downtown to St. Olaf and Carleton alumni, parents and students, visitors to many sporting events, and perhaps even be in a few parades. 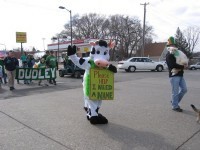 The inaugural appearance of the (as of now un-named) cow was at the St. Patrick’s Parade today (Saturday, March 15th) where she was greeting people, handing out “name the cow” ballots, and tossing Milky Way candy bars. So get creative and help us name the Downtown Cow. “Money, the Downtown Cash Cow” shows up at downtown events and passes out chocolate silver dollars to all the kids. At the big events, “Money, the Downtown Cash Cow” draws names out of the hat for bigger prizes, say $100 in chamber bucks. The marketing strategies and tie-ins for “Money the Downtown Cash Cow” are endless. “Money, the Downtown Cash Cow”…..There’s your winner. Well, I’ve heard from some downtown building owners that these older structures can be money pits and Tracy Davis pointed out on http://locallygrownnorthfield.org/archives/3132/ that downtown is in fact a source of economic wealth for the overall community and certainly property owners seem to feel like the Legislature treats downtown as their cash cow, so I kind of get the conceptual underpinning to your entry in the contest. However, I was thinking about something a little more warm and fuzzy sounding, like “Bessie”, or “Daisy”, or “Moolinda”. Marjorie (“Marge” to friends) in honor of my mother, Marjorie Cox, a well-known and outspoken citizen of Northfield. She was on the City Council for years, she was active in many sphere (political, church, service, family, neighborhood, etc.0…but most important…as a defender of honesty and morality. She fought off a criminal when he tried to mug her. She was 76 at the time. Mary Lou in honor of Mary Lou Street. She was a founder of the CAC, active in many rolls and an all-around great person.